The other day I was thinking about Christmases past and my Mom’s twice baked potatoes and I’m pretty sure I started drooling in the dairy aisle of Fairway Market. I know it’s sort of an absurd craving but I wanted one right then and there. 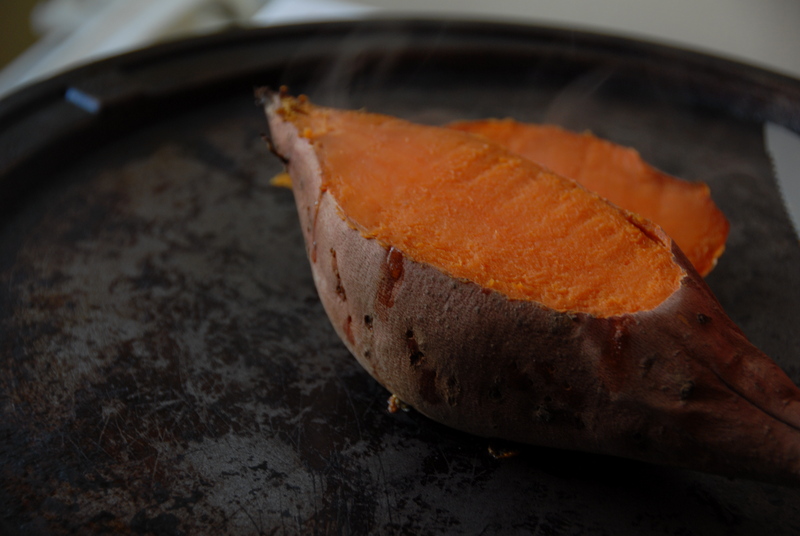 I decided to attempt a sweet potato version with slightly healthier ingredients than boursin cheese and mounds of butter. My twice baked tater morphed into a sort of grab bag of autumnal ingredients but honestly, it turned out to be really really good! It’s a meal in and of itself (made for a great lunch on Monday) or can be a winning side dish. Try it, I know you’ll like it! Fork your potato and place on a baking sheet to cook until soft – it should take 45 minutes to an hour, depending on the size of your tater. Once it’s soft cut the top off, revealing to you it’s orange goodness. In a small saucepan brown the butter. Careful not to let it burn! Once it starts to give off that nice nutty aroma turn off the heat and add the sugar and spices. 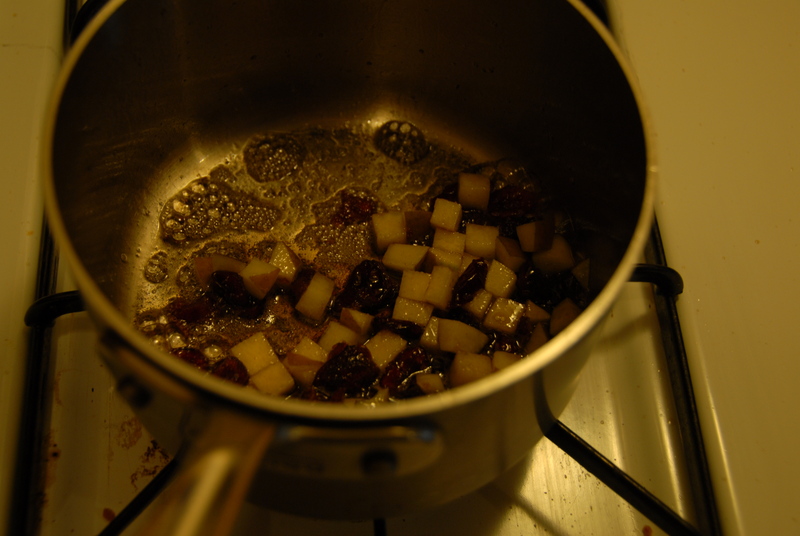 Next add in the pear and cranberries. 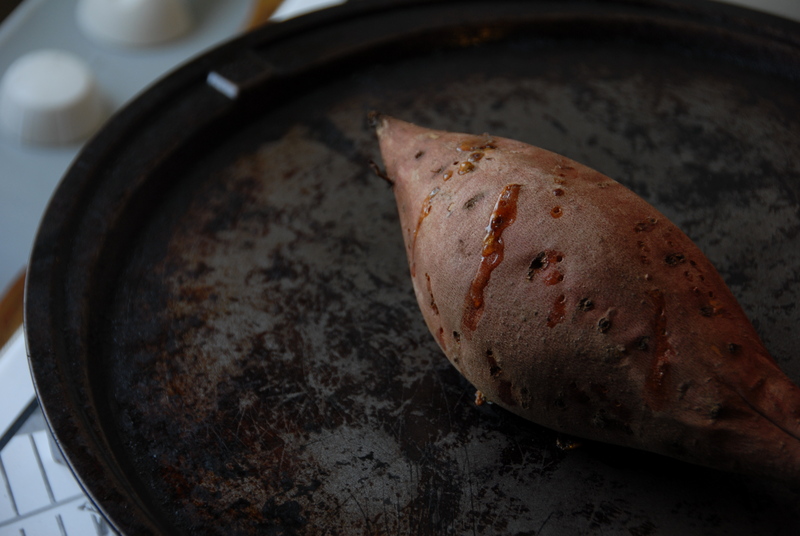 Dig out the innards of the sweet potato and add it to the butter n’ things. Incorporate well and season with S&P. Place it back in the potato skin and top with blue cheese. Place the potato back in the oven or under the broiler for a few minutes until the cheese melts. As a finishing touch drizzle balsamic vinegar over it and enjoy. This entry was posted in Sweet Potato, Uncategorized and tagged balsamic vinegar, blue cheese, dried cranberries, pear, sweet potato, twice baked. Bookmark the permalink.